With September coming to an end, it is officially Fall time in San Diego! The crisp smell of fall is in the air as the leaves start to change, Halloween decorations make their appearance, and people are sipping on their pumpkin flavored beverages (aka Pumpkin Lattes!). It’s the perfect time to start planning for Halloween with costumes for you- and your furbabies. Halloween is a wonderful time of the year that should be a fun and safe time for all! Here are some great ideas and tips to prepare your pet for the upcoming Halloween events. Whether you go for a spooky or a cute costume, dressing up is the most exciting parts of Halloween. Most people love to get their creative juices flowing and go all out when it comes to dressing up. Your pet may want to join in on the fun as well! You can create your pet’s cute ensemble yourself or hit up the local stores that carry a variety of pet costumes to choose from. When picking out a costume keep in mind that the costume should be comfortable for your pet. You want the outfit to fit correctly and comfortably, without it being too tight or restrictive. It’s always+ safe to make sure your pet’s mouth and eyes aren’t being covered by their costume. That way they won’t feel restricted in their movements as they pounce around showing off their costume. If your pet doesn’t enjoy wearing any sort of costume, then please do not dress them up! Halloween is the biggest time of the year to indulge in wrapped chocolates and candies. As always, these sweet treats should never be consumed by your pets. Chocolates and candies can be fatal if consumed by your pet. Chocolate, especially dark, contains theobromine which is a toxic ingredient to dogs. Some candies, such as Raisinets, contain milk chocolate and raisins which are also toxic to dogs and should never be given to your pet. Another fatal ingredient for pets is Xylitol which is commonly found in sugarless treats such as Mentos, gum, and hard candies. Have a safe, secure spot where your children’s big ol’ bag of treats can be kept away from your pets. It’s also a good idea to keep the bowl of candy for the trick or treaters in a high, out of reach location. Always call your Veterinarian if you know or suspect that your pet has gotten into any candy. Anxious pets are likely to have a hard time dealing with all the commotion and stress on Halloween night. 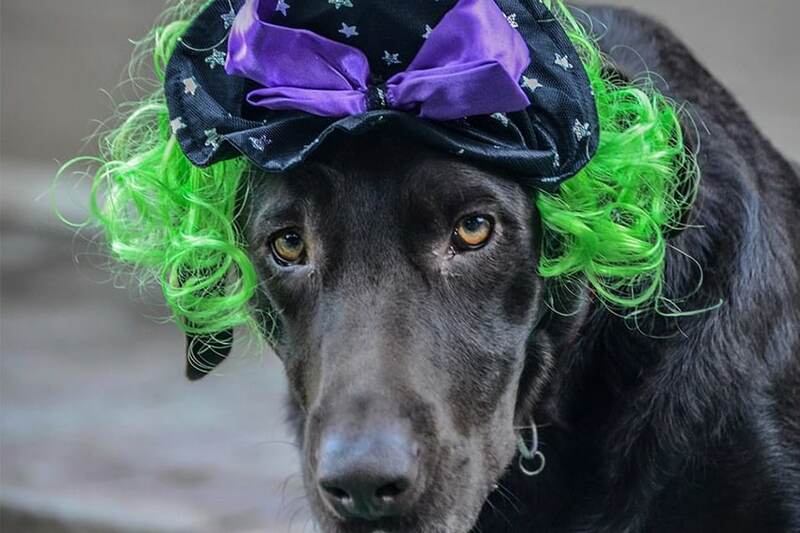 Your pet could become stressed with the high number of costumed kiddos coming up to the door along with the doorbell going off every few minutes. Your pet will be a lot more comfortable away from all the spooky ghouls and in a room filled with all their favorite things! Create a comfortable environment filled with with their favorite toys and activities, blankets, and background noise such as calming music or their favorite tv show. Having your pet crated or in a separate room also lessens the chance of door bolters making a dash through the front door. Have ID tags on your pet’s collars and keep a close eye on your pet as you open the door for the trick or treaters! San Diego is notorious for fun seasonal events and festivals all over the county! Halloween time is no exception as there are many fall events happening. Check out your local San Diego ad or websites to see what’s going on around you. Look into the event details to see if your dog can join in on the festive events too! There may even be Halloween events that are dedicated to your pets such as costume contests. Bring out your dog in their best costume and win some prizes! As always in public places, make sure your pup is leashed up and wearing their dog tags on their collars. Pumpkins are the essence of Fall! Pumpkin flavored treats are a perfect healthy, festive treat for your dog. Not to mention pumpkin is a low-calorie food packed with health benefits. Pumpkin contains lots of vitamins, antioxidants, and fiber! Why not get your dog in the fall spirit with a yummy DIY pumpkin dog treat. 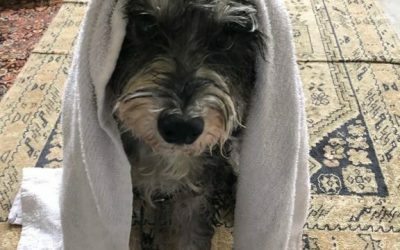 I found this recipe on itdoesnttastelikechicken.com – a vegan website with healthy human and dog food recipes! Mix all ingredients together, roll out onto flat surface, cut dog treats with cookie cutter pieces (you can be extra festive and use Halloween themed cookie cutters!) Bake for 25 minutes at 300 degrees. Halloween is a fun time of the year that can be enjoyed by humans and pets with these great ideas and safety tips! 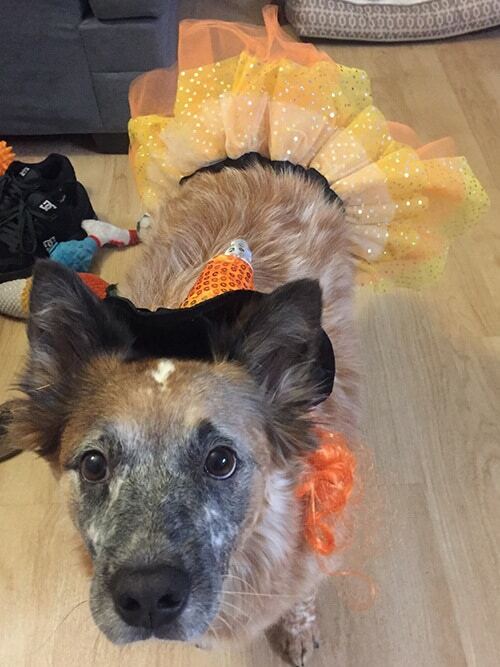 Happy Halloween from the JenLovesPets Team!